Spain’s Dark Moor is another band that has been pressing on for a long time, better than 20 years. Formed in Madrid by guitarist Enrik Garcia, the band returns with their tenth album, Project X. While I can’t be sure, as information about the album is lacking from the band, it appears this album has some sci-fi theme. But moving on. There are two basic reasons why Dark Moor is one of my favorite metal bands. One is vocalist Alfred Romero. He simply has a terrific voice: clean and clear, melodic and emotional, often having the timbre of one classically trained, but not grossly operatic. I like listening to him sing. One listen to I Want To Believe, which has this near Gospel music vibe, and you will be convinced. I’ll even put forward that, sometimes, he reminds me of Freddie Mercury in his passion. The second reason is that Dark Moor has this uncanny ability to meld classic melodic heavy metal and hard rock, add a lush symphonic atmosphere, scatter in some heaviness and tempo, and then wrap it up in pure AOR accessibility. Like Romero’s voice, their music, the songs, are always a pleasure to listen to. You can hear the wonder of this compositional magic in the rock groove of The Existence or the bombastic power metal flair of Abduction. All these songs come together in the closing epic number, There’s Something In The Skies. Huge and engaging, it’s a sweeping melodic and symphonic monster. And Romero’s voice gave me goose bumps. Yeah. He’s that good. Also, and perhaps a third reason why I dig Dark Moor is that Enrik Garcia is a terrific guitarist and he loves doing solos. They’re all that you would expect: technical, fiery, soaring, just plain thrilling. Okay. So I’m a fan. 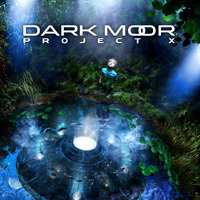 Believe it when I say, Dark Moor’sProject X is everything a fan of melodic and symphonic heavy metal loves. Get it. Very recommended.